I received a copy of The Force Unleashed: Ultimate Sith Edition for Christmas this year. This rerelease of the original game also comes with all 3 DCs that have since come out for the game. The final downloadable content was an alternate universe play on the battle of hoth. 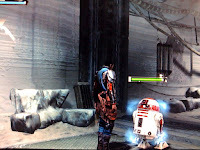 In the halls of the rebel base I found two different red R2 units, just like mine. The first is by itself in a hall way. It plays the same sounds as the other droids in TFU. The animations are the same, including the split-in-half destroyed animation. next room. 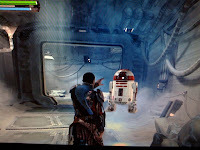 Sitting off to the left, this droid is the target of a Wampa who jumps out of the wall when you enter the room. Timed right, you can grab the Wampa and toss him out of the way. Also in this room is a Yellow R2.